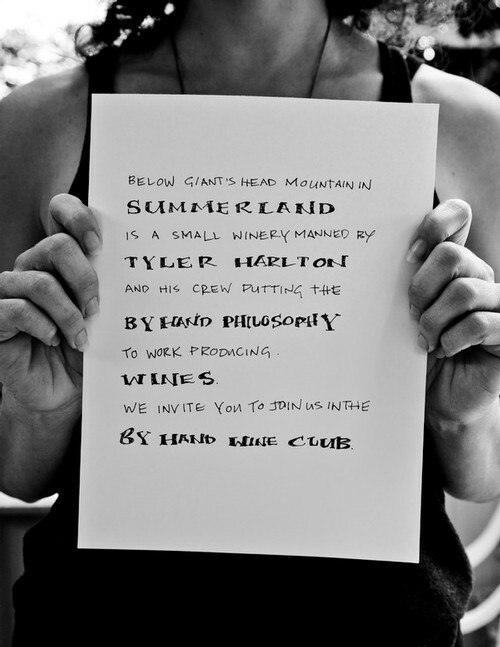 By Hand Wine Club members will receive a mix of library wines, pre-releases, exclusives, and current offerings in addition to other goodies. We'll include you in the industry conversation: on the wines and the way they move with food, on the vines and the magical transformation of the fruit, and the other stories from the invisible undercurrent that is shaping Okanagan terroir. Shipments are every two months and cost $149.99. This includes 4 bottles of wines and free shipping. Free shipping on all additional purchases placed at the same time. Want to skip a shipment? Not a problem. It’s easy to opt out/opt back into the club. Sufficient advanced notification will be required if you wish to opt out of one of the bi-monthly shipments. Shipment notification emails will be sent out prior to each shipment. We'll fill you in on the important details such as wines we have selected for your upcoming club package, shipment and pick up dates, when orders will be processed etc. Unsubscribing is easy. Call or email us and we will remove you from the club. 30 days advanced notification will be required if you wish to terminate your subscription entirely. Live local? Come and pick up in person. We'll have a few samples of your club package to enjoy! Refer a friend. Receive 20% off any website order when you refer a friend who signs up to the club. Free shipping on any additional purchases.